Children spend significant time indoors on the computer, watching TV or playing video games, resulting in a rise in childhood obesity. In fact, according to the National Center for Chronic Disease Prevention and Health Promotion, childhood obesity numbers have more than tripled since 1980. 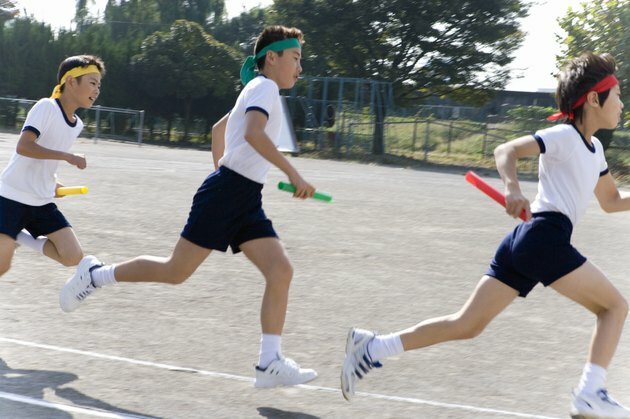 The only time many children are involved in physical fitness is in gym class. Making gym class fun can increase the chances that children will enjoy physical activity, instead of seeing it as a chore. According to Mr. Gym, this game is appropriate for children in grades two through 12. You will need enough tennis balls for each student in the class. Ask students to spread out randomly throughout the gym. Choose a few students to stand on the outskirts of the gym to act as judges. The instructor rolls, kicks or throws the balls out around the gym. The object of the game is to keep all the balls moving. Children must keep the balls in motion around the gym without letting them stop, either by rolling, bouncing or throwing the balls. The judges call out the word "hectic" and point at any balls that stop moving, so children have a chance to put the ball in motion again. If the ball is not put back into motion after five seconds, the instructor takes the ball out of play. The game is over once six "hectic" balls are taken out of play. This exercise is beneficial for large muscle development and promoting creative play, according to Mary Mayesky in her book, "Creative Activities for Young Children." Imagination exercises are a good warm-up game for gym class and are suitable for children in preschool and elementary school. Ask children to spread out around the gym and act like their favorite animals. Ask them to make sounds and move around the gym, imitating their chosen animal. Split the class into teams of three players each. Place a basketball or volleyball in the middle of each group. The students must follow your commands, in a style similar to Simon Says. Call out commands to the class, such as "touch your head" or "hop on one foot." When you say "grab the ball," the students must try to be the first to grab the ball in the center of their circle. The first person to grab the ball wins the game. The snake is appropriate for elementary school children. You will need approximately 10 cones. Place the cones 3 feet apart in a straight or diagonal line, or randomly around the gym. Tell the students that they are going to pretend to be snakes. Ask one student to be the head of the snake, and ask the other students to line up behind the head. The head leads the line by weaving in and out and around the cones. The other students must follow and copy the head's moves without bumping into each other.